Pennsylvania Precision Cast Parts (PPCP), an industry-leading manufacturer of top-quality investment castings for a broad range of parts, industries and applications, has launched a dynamic new website. We designed our new website to provide our customers and visitors with an industry resource, in addition to information about our company. 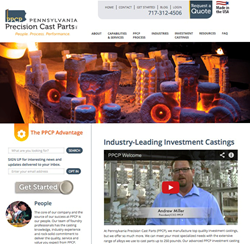 Pennsylvania Precision Cast Parts (PPCP), an industry-leading investment casting company located in Lebanon, Pa., is pleased to announce the launching of its dynamic new website: http://ppcpinc.com. The website was developed to share PPCP’s extensive investment casting capabilities and communicate its new brand – People. Process. Performance. The new PPCP website is rich with content that reflects the company’s decades of experience and cutting-edge technology, processes and facilities. In addition to sections about PPCP’s capabilities, services, quality process and industry specializations, it contains information about the investment casting process and resources like Metal and Energy Surcharges, Pressure Equipment Directive (PED) and more. The PPCP website will feature timely and newsworthy posts, as well as items that are useful, interesting and entertaining. This content will give visitors interested in investment casting a reason to return again and again. Another objective of the website is to share things about PPCP that customers and others in the industry may not know. Customers can request a quote right from the website, and visitors can subscribe to join PPCP’s online community. In the future, the PPCP website will feature new content, such as additional videos, case studies, customer testimonials, new downloads and more. Company Information - Pennsylvania Precision Cast Parts (PPCP) is an industry-leading manufacturer of top-quality investment castings for a broad range of parts, industries and applications. PPCP has the experience, technical expertise and quality-assurance processes necessary to consistently and reliably deliver castings up to 250 pounds in an extensive array of alloys, from steel and aluminum to highly specialized materials. Located in Lebanon, Pa., PPCP has two fully equipped facilities, cutting-edge equipment and technology, advanced processes and one of the most experienced teams in the industry. PPCP delivers investment casting excellence through exceptional People, Process and Performance.